Do I need to acclimatize my timber floor before installation? This is a very common question and subject that is largely misunderstood so firstly let’s describe how timber gains/loses moisture and the meaning of acclimatization. Wood is a hygroscopic substance meaning it has the ability to take in or give off moisture in the form of vapour. The water contained in wood exerts vapour pressure of its own which is determined by the maximum size of the capillaries filled with water at any time. If the water vapour pressure within an ambient space is lower than the vapour pressure within the timber in that space, desorption takes place as the timber loses moisture. 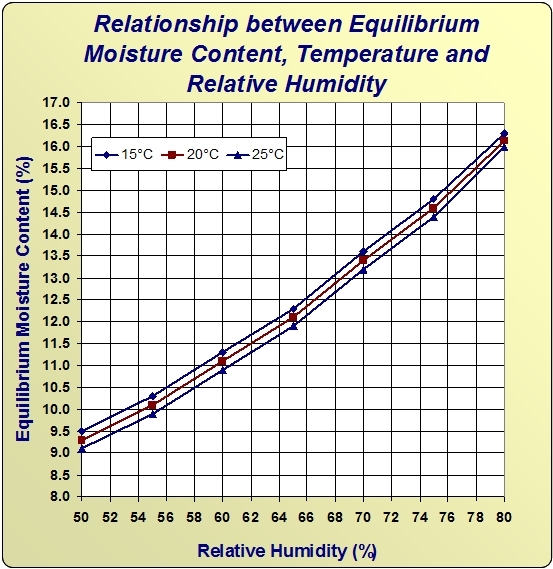 The balance between the moisture content of timber flooring and the long term ambient conditions of a building or geographic region is known as the Equilibrium Moisture Content (EMC) which can be assessed against published isometric charts. It’s important to note that the EMC of timber varies significantly with ambient relative humidity and to a lesser extent with temperature and other related factors. Acclimatization is the process of allowing timber to adjust to the ambient environmental conditions in which the flooring will be installed. The primary reason for acclimatizing timber is to minimize the dimensional changes (or movement) in the final product. Once the average long term moisture content for a building is identified, acclimatization to that specific value is appropriate prior to installation. The time for acclimatization will be dictated by the condition of the flooring at time of delivery, the degree of adjustment required and the prevailing internal ambient conditions at the time. Artificial modification of internal conditions to favour the target moisture content value can assist in reducing the acclimatization period. When a hygroscopic material such as timber flooring neither gains nor loses moisture when exposed to a specific combination of ambient temperature and humidity, acclimatization has occurred. Unless a building has permanent climate control, acclimatization of timber flooring to a particular dwelling or building will never be perfect and should be in harmony with the “average” in-service conditions of that particular building or region over time. Acclimatizing timber to a particular season prior to installation will only stabilize the timber whilst those conditions prevail. Most homes and buildings experience regular changes to ambient conditions and when timber is exposed to a change in ambient moisture (relative humidity) the timbers moisture content will fluctuate to suit the prevailing conditions of the period. This may result in minor dimensional change to the boards which is completely normal in this naturally occurring product. It’s imperative that your chosen contractor has a firm understanding of timber moisture contents and acclimatization and as a minimum they should always be moisture testing the timber on site prior to installation.